More photos of entire ship model, of details. Click on the photos for high resolution pictures! The American USS BONHOMME RICHARD under the command of Paul Jones became famous when she took the English frigate HMS Serapis as a prize after a 4-hours-fight in the North Sea in 1779. Paul Jones was one of first commanders in the emerging US Navy. In 1777 he had got the mission to carry the war against England to Europe. In France he managed to purchase the East Indiaman Duc de Duras, converted her to a frigate and renamed her BONHOMME RICHARD. On 23 September 1779 the ship and her small squadron met an English convoy guarded by the the English frigate HMS Serapis. A battle took place near Flamborough Head on the eastern coast of England. Although the American ship got so heavily damaged that she sank the next day, Paul Jones managed to take the Serapis as a prize. By this Paul Jones became famous in Europe and America. The ship model was built according to plans of Jean Boudriot (Collection Archeologie Navale Française). It is 1 : 48 scale. Length is 138 cm, width 44 cm, height 117 cm. It is a beautiful piece of work, very finely detailed. The planks are made of pear and ebony, the deck is maple and the carvings are made of boxwood. 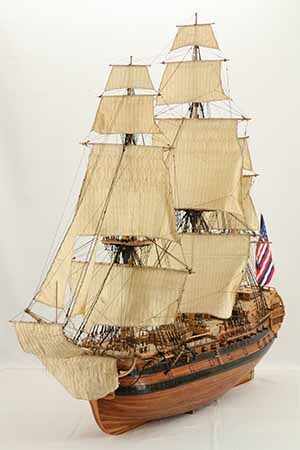 The model's sails are set as running downwind on port tack. There are two stands the model could be put in. One is shown in the photos above, the ship model being stabilized by two small wedges in the middle of the hull. The other one is a somewhat bigger massive black board, putting the model some cm above the ground. When comparing the two stands I personally prefer the two small wedges. 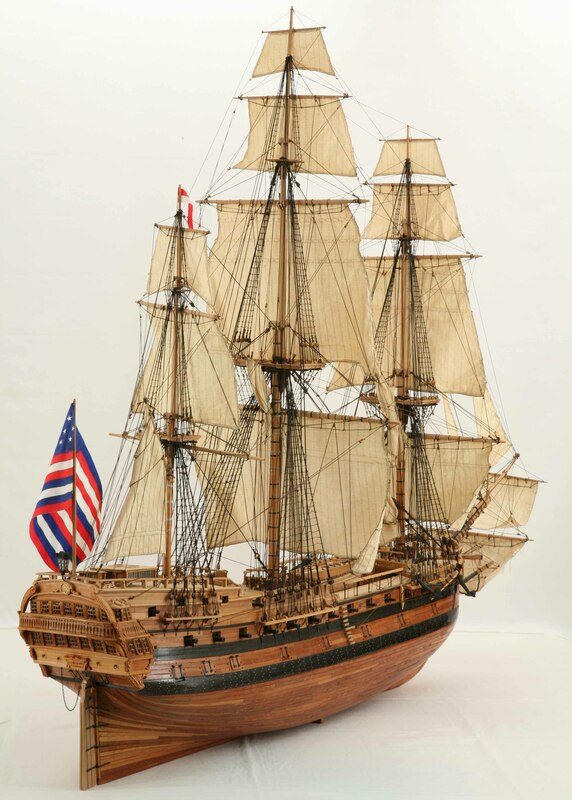 The US flag used by Paul Jones, as shown on the model, later was named after him.